Dongyue Temple, an ancient heritage site in northwest Beijing once owned by the Nalan family, is a shadow of its former glory, say villagers. Rotting rubbish covers the grounds, while its four main buildings are crumbling from a lack of maintenance. It has stood for more than 1,000 years and was once owned by a Chinese royal family, yet the corridors of Dongyue Temple no longer ring with voices in prayer, nor is the air filled with the scent of incense. Instead, it is close to ruin; the temple buildings are crumbling and the grounds surrounding them are piled high with litter. Experts say the 18,000-sq-m complex, which is in Beijing’s northwest Haidian district, has suffered decades of neglect despite being included on two lists of key cultural heritage. Dongyue Temple highlights the massive challenge China faces in trying to protect cultural heritage, say experts, many of whom warn that insufficient funding and rapid property development have put vital relics under threat. Originally built as a Taoist temple during the Tang Dynasty (AD 618-907), the site was later owned by the Nalan royal family in the 1600s and is famed for its links with ci poetry, a popular Chinese form of lyrical verse. Time began to take its toll on the temple’s four main buildings following the fall of the Qing Dynasty (1644-1911) and in 1949 it was one of three ancestral temples incorporated into the site of a military hospital. One of the temples was demolished, while the other was converted into a conference hall. The ancestral shrine was listed as a Key Cultural Heritage site by the Haidian district authority in 1997 following the discovery of the Nalan family tombstone. It was also named one of 30 Beijing Key Cultural Relics by the city in 2003. Yet today it is all but abandoned, with only a handful of families living in its buildings. “They are the families of either retired cleaners or workers who were employed by the hospital,” a 70-year-old temple resident surnamed Wang told China Daily. 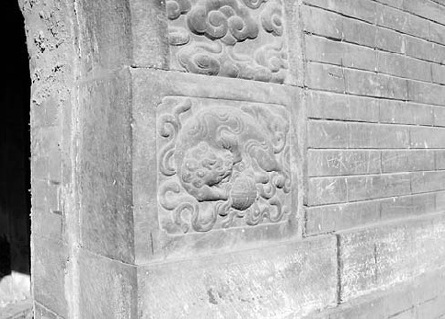 Walking through rooms on the complex, there is little sign of Dongyue Temple’s former glory. Gone are the elaborate wall hangings, and visitors must now tread carefully to avoid stepping on discarded rags of clothing or rotting rubbish. There is hope for Dongyue Temple. Bosses at the military hospital are in negotiations with the local cultural protection officials about turning the property over to the government in return for land. If a deal is successful, money could be spent to extensively refurbish the temple. “The old temple has been useless to the hospital for a long time,” said a hospital source who did not want to be identified. The hospital, which lies about 30 km from the capital, houses a general and psychiatric clinic, covers 22,000 sq m, has a capacity of 800 beds and cost about 90 million yuan ($13 million) to build, according to the official website of the hospital. If agreed by officials in Shangzhuang, the township that administers Yongtaizhuang, the temple-land exchange plan would see the hospital receive 18,000 sq m of adjacent land on which it can expand and increase capacity, the inside source told China Daily. The local government declined to comment on the deal. However, local media reported that, while officials are keen on taking responsibility for the temple, they are reluctant to part with a large area of land to get it . Experts have supported the proposed exchange but many have also slammed the time it has taken for authorities to find a solution to the problem. 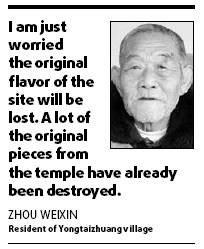 Little work has been done to maintain Dongyue Temple since 1949 because of limited technology and resources, according to Huang Zhaotong, former deputy general director of the Nalan Family Relics Co. The most recent repairs were carried out in 2006 when the Haidian district culture commission and Beijing Administration of Cultural Heritage spent almost 2 million yuan to reinforce the main building and prevent it for collapsing, Beijing News reported. Companies or government work units are legally required to maintain or renovate any protected sites of cultural importance they occupy under the Law on Protection of Cultural Relics, which was implemented by the State Council in 2002. However, many business owners argue they simply do not have the funds to carry out the necessary work. “To entirely renovate Dongyue Temple it would cost at least 100 million yuan but that is far beyond what the hospital could afford,” a hospital source told China Daily. Xie Chensheng, an advisor to the State Administration of Cultural Heritage, said he believes no relic should fall into ruin and urged local authorities to offer more help in shouldering the financial burden. “Even if work units using heritage sites cannot pay for repairs, cultural protection departments can. The Beijing Administration of Cultural Heritage is rich enough to afford the fees, absolutely,” he said. According to Qiu, before 2007 the Haidian district government spent less than 500,000 yuan protecting relics. However, that soared to 4 million yuan last year and is expected to more than double to 10 million yuan in 2010. The annual amount spent by the Beijing cultural heritage bureau already tops 10 million yuan, he said, although the city authority did not respond to efforts by China Daily to confirm the figure. Heritage experts say they fear government money is failing to reach those relics not recognized at municipal level. Beijing alone has 326 heritage sites with municipal status or above. Haidian district has 16 national-level cultural relics, 21 municipal, 32 district and 280 others with minor status. The temple-land exchange plan was first mooted in 2002 but the deal broke down “because the local authority were more interested in agricultural revenue than saving a temple,” said Huang Zhaotong. The talks restarted in 2007. While the future of the site remains uncertain, villagers have raised concerns about the temple being made into a tourist attraction if it is handed over to the local government. CHP would like to thank China Daily for allowing us to republish the article for educational purposes.